There are a number of so-called “lost gems of the Light Programme and Home Service” airing on Radio 4 Extra over Christmas. As ever it’s great when the BBC dusts off (one somehow imagines the reels sitting on dusty old shelves rather than the temperature-controlled reality) these old comedy shows. All but one, the edition of Up the Pole, have not been heard on the radio in decades. And two really were “lost” as they come from off-air recordings provided by the Goon Show Preservation Society. Over the Garden Wall was a Light Programme comedy in 1948/9 starring Lancastrian comic Norman Evans in which he brought his variety stage act of Fanny the garrulous gossip to the radio. His co-star was Ethel Manners (of the musical hall act Hatton and Manners) who played Mrs Higginbottom. A Date with Nurse Dugdale was a six-part series that ran in 1944 starring Arthur Marshall as the eponymous Nurse Dugdale with her catchphrase “Out of my way deahs, out of my way instantly!” It was spin-off from the series Take It From Here, not the long-running Muir/Norden creation but an earlier 1943/44 series. Both Take It From Here and the Nurse Dugdale programmes also featured the May Fair Hotel Dance Orchestra conducted by bandleader and later renowned-DJ Jack Jackson. Up the Pole ran for four series between 1947 and 1952 and starred Jimmy Jewel and Ben Warriss initially playing the cross-talking proprietors of a trading post in the Arctic. Later series shifted the action an apartment in a disused power station and a rural police station. Only one edition survives, from 1 November 1948, but has been heard again as part of Bill Oddie’s turn on Radio 7 and Radio 4 Extra as The Comedy Controller. It’s Great to Be Young was Ken Dodd’s first starring programme and ran between October 1958 and January 1961. It’s the one that gave rise to Doddy’s catchphrase “Where’s me shirt?” and co-starred impressionist Peter Goodwright. Blackpool Night was a regular summer series of variety shows that ran from 1948 to 1967. It gave early radio appearances for Ken Dodd and Morecambe and Wise and its Eric and Ernie that star in this repeat from 18 August 1963. 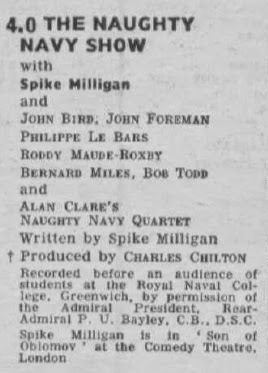 The Naughty Navy Show was a one-off Home Service comedy from Christmas Day 1965 written by and starring Spike Milligan along with John Bird, Bernard Miles and Bob Todd. Sid and Dora was another one-off show from 25 December 1965, this time over on the Light Programme. Described as a ‘domestic comedy for Christmas’ it starred Sid James, Dora Bryan and Pat Coombs. The Army Show also stars Spike Milligan and shares cast members with The Naughty Navy Show as well as Barry Humphries and Q series regular John Bluthal. The show was first broadcast on 16 June 1965 and has only been repeated once, and that was in 1966. There’s more Milligan in the The GPO Show from Christmas Day 1964. 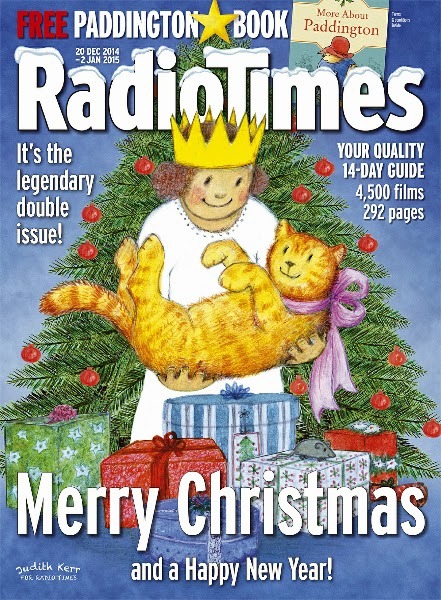 The Radio Times unhelpfully describes it as follows: “Spike Milligan takes a benevolent but distinctly Milligoonish look at the work of that mighty institution the British Post Office. In fact he braves the hallowed precincts of Mount Pleasant itself, to report the merry, festive scene. With the stalwart shape of Harry Secombe and John Bluthal, to name but six, he will be giving listeners a seasonal view of Operation Mailbag in full swing.” The GPO Show was recorded just five days before transmission and by then the Post Office had objected to the title on the grounds that GPO was a registered trademark so it was hastily changed to The Grand Piano Orchestra Show. 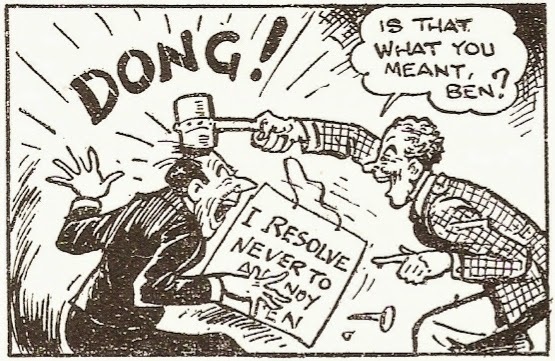 The script, in part, was a re-working of an earlier Goon Show from 1954 titled The History of Communications. And finally also worth mentioning, and of more recent vintage, is a repeat of the 2008 Archive Hour feature on Kenny Everett from music journalist Mark Paytress in Here’s Kenny. Heard Sid And Dora tonight and considering its vintage and the fact it's a one off, it was surprisingly entertaining and managed to raise a smile.